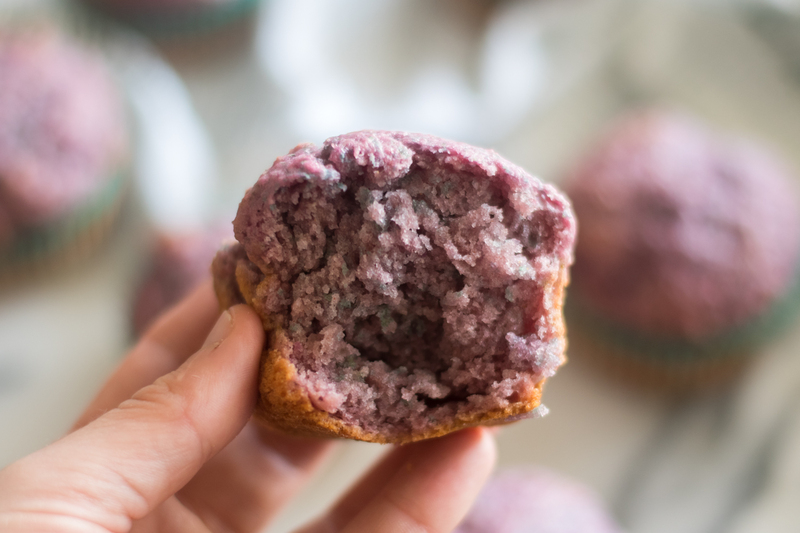 These Purple Sweet Potato Muffins are a moist, tender muffin! 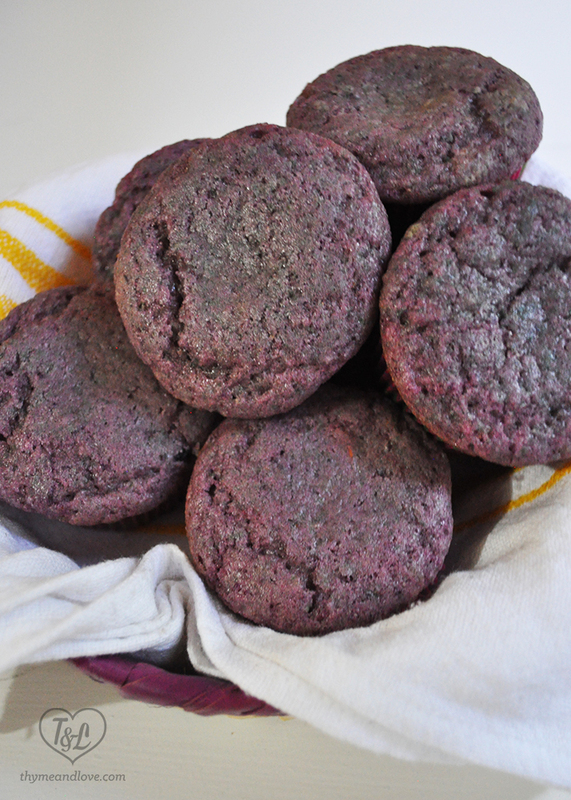 I originally shared this recipe for Purple Sweet Potato Muffins in 2014. The photos were horrible and I’ve been wanting to update them for awhile now. I first made these muffins when I was living in Mexico City. 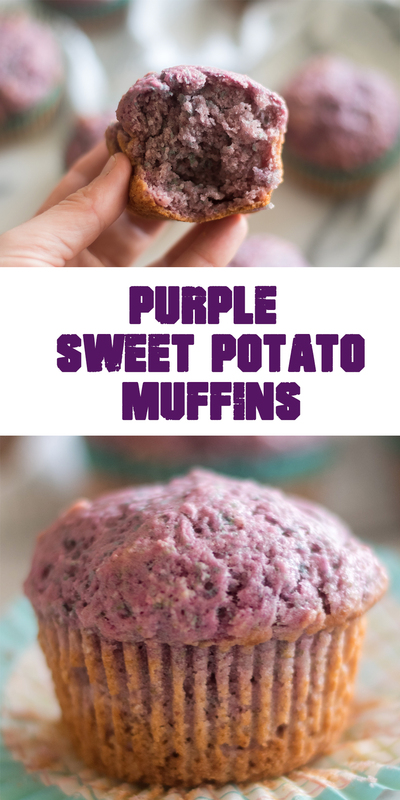 I found these gorgeous purple sweet potatoes at the local market and wanted to created a baked good with them. I cooked and pureed the sweet potatoes to use in a muffin batter. 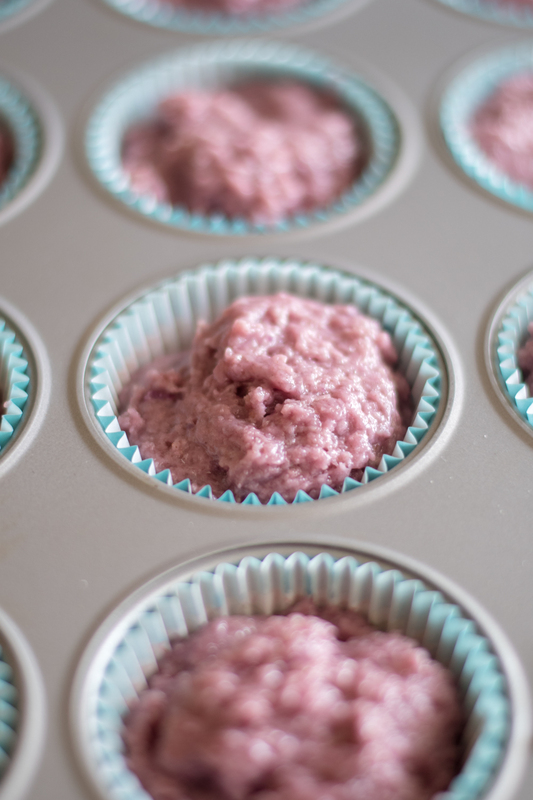 The purple color fades out after the muffins have baked in the oven. If you follow me on Instagram, you probably saw that in my stories I couldn’t get over the color of the muffins. The muffins turned a speckled color. A mix of purple and blue/gray. When I first made them, the color turned more grayish. I think it depends on how purple the potatoes are to begin with. The muffins still tasted delicious. They are sweet, tender and moist. No matter the color, they are still very delicious. 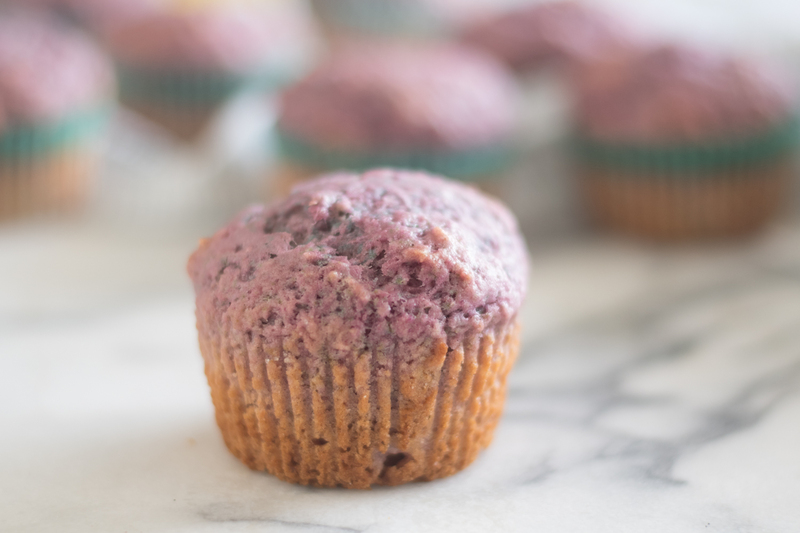 I think that these are a fun muffins that kids will enjoy too! 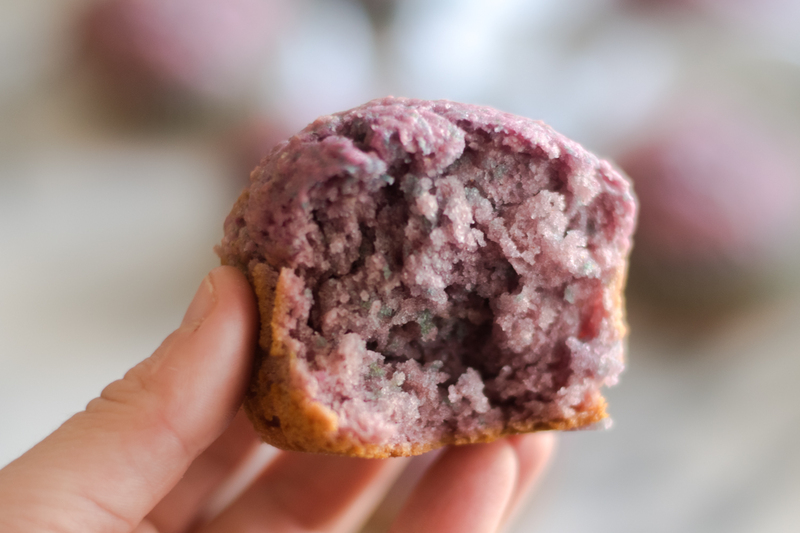 watch this video to see how easy it is to make these muffins! 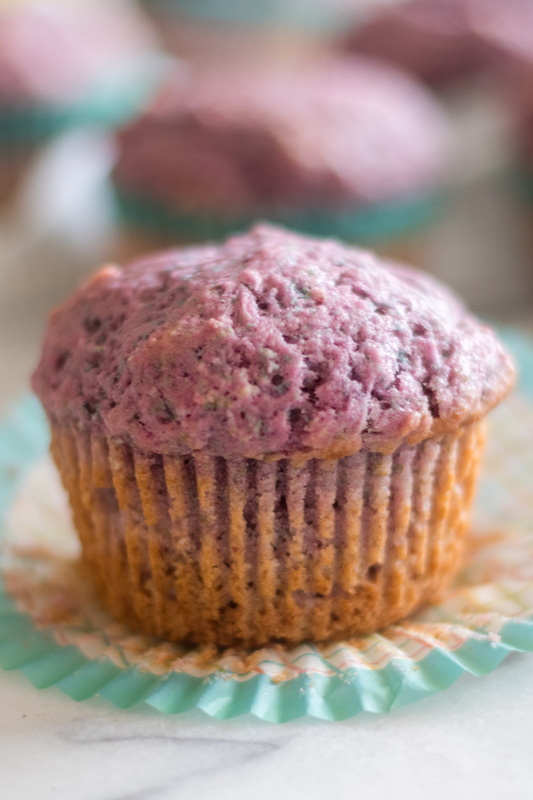 Purple Sweet Potatoes are pureed and used in the muffin batter to create a fun & different muffin. Make the sweet potato puree. Dice the peeled sweet potatoes into medium size pieces. Place into a large saucepan and cover with water. Bring to a boil and reduce to a steady simmer. Cook until for tender about, 15-20 minutes. Drain the potatoes and transfer to a food processor. Puree until the potatoes are smooth. If the potatoes are having trouble getting to a smooth texture, add in a few tablespoons of non-dairy milk. Measure out one cup of pureed potatoes and set aside. You might have a little bit of extra potatoes. Let the puree cool to room temperature. In a large bowl sift together all the flour, sugar, baking powder, cinnamon, and salt. Set aside. In a medium bowl, whisk together the oil, milk, maple syrup, vanilla and sweet potato puree. . Slowly add the wet ingredients to the dry ingredients. Gently combine. Do not over mix the batter. Transfer to a 12 Cup Muffins Pan lined with paper liners. Fill the liners 2/3 full. Bake 18-20 minutes, or until a toothpick inserted comes out clean. If you can’t find purple sweet potatoes, you can always use regular sweet potatoes. You might have leftover puree, which taste great on its own. The recipe was updated on April 2, 2018. 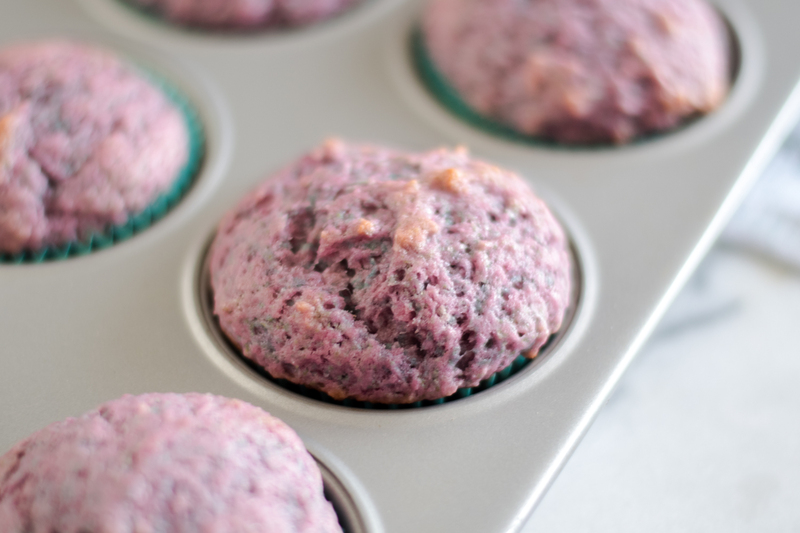 Have you ever baked with purple sweet potatoes before? I’m so glad you persevered through all those technological challenges. I don’t know what I would do if I lost my blog! Its sad to see so many hours (and years) of work lost. But you have even more great posts ahead of you! Those purple sweet potatoes are so beautiful! Thanks Diana! I know it is sad to lose everything. I am excited for the future though. Thank goodness for Hector. He really helped me and helped me figure everything out. I really couldn’t have done it myself. Why does technology have to be so complicated?! I used regular milk because I didn’t need these to be vegan and I didn’t have almond milk, but these were amazing. My husband doesn’t like sweet potato in anything and even he gave the thumbs up.